Shipping Containers for Sale and Hire. 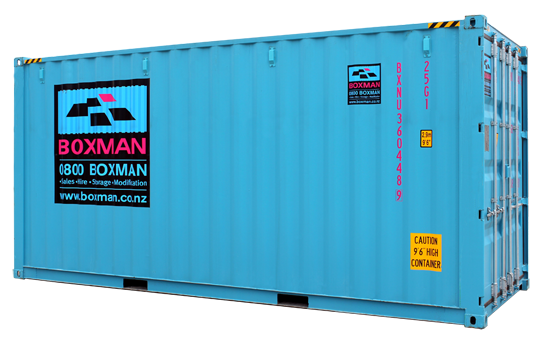 Established 1990, Boxman are shipping container, self-storage and modification specialists with branches and stock throughout New Zealand. Trusted suppliers of shipping containers to New Zealand since 1990. The service was excellent. The process of hiring the special unit that we required was made easy by the Boxman team at Seaview depot. We will use Boxman again. The staff at Boxman have always dealt with our requests for containers quickly and always kept up good communications when it has been difficult to source containers. Just wanted to say thank you for sorting that all out so efficiently – the container has been delivered and neatly parked on the grass verge. I was out at a meeting with the builders when it was delivered but the driver used his noodle and put it in the right place. It’s lovely and clean, and is a very pretty shade of blue! We're very pleased with the container, and we are particularly pleased with the service provided. Michelle was a delight to deal with and Rangi was great. He went way beyond what we could have expected. Not only did he manage to insert the container into a difficult space using a careful multi-stage procedure, he went to a lot of effort to make sure it was leveled and angled just right. He also gave us a general introduction to container management and didn't leave until he was sure we were happy. All round, great service. Thank you. Great service with helpful staff. Boxman have always been our first point of contact for containers, and I have no reason to change. Every effort is made to satisfy our container requirements. Friendly and courteous to speak with. A huge thank you to you and James for your wonderful service - will most definitely be recommending Boxman to anyone in the market for a container. It was great to have you and your organisation involved with NZ IceFest 2014. We couldn't have put on such a great festival without your help so we would like to say a big thank you from the entire NZ IceFest team for all your hard work! I wondered whether I was pushing it with the guarantee on your website about "The container you want, when you want it'" but you did it with ease. Container is now on site and very happy with it. Thank you for making it happen, your effort is very much appreciated. I would just like to thank you and the team at Boxman for making the purchase and assistance for delivery of the shipping container smooth and seamless for my tight timeframe. It was much appreciated. With branches throughout New Zealand, Boxman have the transport networks to efficiently supply shipping containers nationwide. Our head office is in Nelson, and we have secure container self storage facilities in Christchurch, Wellington and Nelson. Why do business with Boxman? Boxman has established a reputation as a high quality service provider focused on our customer’s requirements whilst maintaining competitive prices.